Katy Perry performing at the Super Bowl XLIX halftime show, February 2015. It is the most watched halftime show according to ratings calculated by Nielsen. 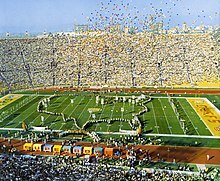 Halftime shows are a tradition during American football games at all levels of competition. Entertainment during the Super Bowl, the annual championship game of the National Football League (NFL), represents a fundamental link to pop culture, which helps broaden the television audience and nationwide interest. 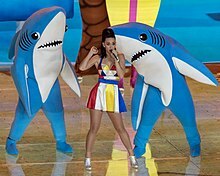 As the Super Bowl itself is typically the most-watched event on television in the United States annually, the halftime show has been equally-viewed in recent years: the halftime show of Super Bowl XLIX featuring Katy Perry was viewed by 118.5 million, as part of an overall telecast that peaked at 120.3 million at its conclusion—the most-watched television broadcast in U.S. history. The NFL announced that the Super Bowl LI halftime show, with Lady Gaga was the "most-watched musical event of all-time," citing a figure of 150 million viewers based on the television audience, as well as unique viewership of video postings of the halftime show on the league's platforms, and social media interactions (a metric that was never calculated prior to 2017). The show was seen by 117.5 million television viewers, making it the second-highest-rated halftime show on network broadcast. During most of the Super Bowl's first decade, the halftime show featured a college marching band. The show's second decade featured a more varied show, often featuring drill teams and other performance ensembles; the group Up with People produced and starred in four of the performances. The middle of the third decade, in an effort to counter other networks' efforts to counterprogram the game, saw the introduction of popular music acts such as New Kids on the Block, Gloria Estefan, Michael Jackson, Clint Black, Patti LaBelle, and Tony Bennett. Starting with Super Bowl XXXII, commercial sponsors presented the halftime show; within five years, the tradition of having a theme—begun with Super Bowl III—ended, replaced by major music productions by arena rock bands and other high-profile acts. In the six years immediately following an incident at Super Bowl XXXVIII where Justin Timberlake exposed one of Janet Jackson's breasts in an alleged "wardrobe malfunction", all of the halftime shows consisted of a performance by one artist or group, with the musicians in that era primarily being rock artists from the 1960s, 1970s and 1980s. These shows were considered "family friendly" and the time in which they took place has been described as "the age of reactionary halftime shows. Since Super Bowl XLV, the halftime show has returned to featuring popular contemporary musicians, with the typical format featuring a single headline artist collaborating with a small number of guest acts. Notes: During the halftime, rival network Fox aired a special live episode of In Living Color, one of the first deliberate attempts at counter-programming. The show drew over 22 million viewers away from the Super Bowl telecast. In mid-1992, citing this, Select Productions pitched the concept of exclusively featuring live concert-type performances from top contemporary musical artists. The concept and pitch is attributed to Select Productions' employee Rick Lewis and prompted the change of the 1993 halftime show to showcase Michael Jackson. Performers: Coldplay, Beyoncé, Bruno Mars, Mark Ronson, Gustavo Dudamel, University of California Marching Band and Youth Orchestra L.A.
U2 performed 3 songs: "Beautiful Day," "MLK," and "Where the Streets Have No Name." During the beginning of "MLK" and continuing until the end of "Where The Streets Have No Name," a large banner behind the band displayed the names of all the people who lost their lives on the September 11 attacks. Bono ended the song by opening up his jacket, the inside of which displayed the American flag. For The Rolling Stones, the stage was in the form of the group's iconic tongue logo (John Pasche's "Cunning Linguist" first used in 1971 on their Sticky Fingers album). It was the largest stage ever assembled for a Super Bowl halftime show, with 28 separate pieces assembled in five minutes by a 600-member volunteer stage crew. The group performed three songs: "Start Me Up," "Rough Justice," and "(I Can't Get No) Satisfaction." The show was viewed by 89.9 million people, more than the audiences for the Oscars, Grammys and Emmy Awards combined. In the wake of the Super Bowl XXXVIII halftime show controversy with Janet Jackson and Justin Timberlake, ABC and the NFL imposed a five-second delay and censored lyrics considered too sexually explicit in the first two songs by briefly turning off Mick Jagger's microphone—censoring to which the group had previously agreed. However, the choice of The Rolling Stones sparked controversy in the Detroit community because the band did not represent the traditional Detroit "Motown Sound," and no artists from the area were included. ^ "Super Bowl XLIX is Most-Watched Show in U.S. Television History With 114.4 Million Viewers". TV By The Numbers. Retrieved March 19, 2015. ^ "Ratings Roundup: Super Bowl LI Halftime Show Is Most-Watched Musical Event In History; NHRA on Fox Revs Up". Sports Video Group. Retrieved February 19, 2017. ^ "Super Bowl LI halftime show was the most-watched musical event in history across all platforms". SB Nation. Retrieved February 19, 2017. ^ "Lady Gaga Scores Second-Most Watched Super Bowl Halftime Show Ever". Deadline Hollywood. Retrieved February 19, 2017. ^ Florio, Mike (February 5, 2013). "If NFL doesn't put on a halftime show, someone else will". ProFootballTalk.com. Retrieved February 6, 2013. ^ Belson, Ken (February 2, 2010). "The Who, and the Super Bowl's Evolving Halftime Show". The New York Times. Retrieved February 7, 2010. ^ "Heal the Kids : Rebuilding: Michael Jackson announces a $1.25-million program to help children in riot-torn areas. Drug education, immunizations and mentor services will be provided". Los Angeles Times. Retrieved January 26, 2017. ^ a b Sandomir, Richard (June 30, 2009). "How Jackson Redefined the Super Bowl". The New York Times. Retrieved February 1, 2013. ^ Pabst, Georgia (February 8, 1993). "Jackson's Foundation Aimed At Helping Children". The Seattle Times. Retrieved August 12, 2009. ^ "The Nielsen Company's Guide To Super Bowl XLIII". The Arizona Republic. tvbythenumbers.com. January 26, 2009. Retrieved January 27, 2009. ^ a b c d e f g h i j k l m n o p q r s t u v w x y z aa ab ac ad ae af ag ah ai aj ak al am an ao ap aq ar "Super Bowl History - Entertainment". National Football League. 2011. Retrieved December 12, 2011. ^ a b c d e f g h i j Krasnow, Lonny. "Top 10 Super Bowl Halftime Shows". Sports Illustrated. Archived from the original on December 27, 2011. Retrieved December 12, 2011. ^ a b c "GSU Tiger Marching Band". History of Tiger Marching Band. Grambling State University. Archived from the original on July 14, 2013. Retrieved December 12, 2011. ^ "Golden Eagles Marching Band". Southeast Missouri State University. Retrieved December 12, 2011. ^ "Michigan Band Super Bowl VII halftime 1973 Remaster Part 2 of 2". Retrieved January 25, 2018 – via YouTube. ^ a b c d "History of Up with People". UpWithPeople.org. Archived from the original on February 17, 2014. Retrieved December 12, 2011. ^ J. Knapfel. "How an Elvis Impersonator Helped Change Super Bowl History". VIPTickets.com. Retrieved January 28, 2016. ^ Andrews, Travis M. (February 2, 2018). "From Elvis Presto to Michael Jackson: How the Super Bowl halftime show found its groove". The Washington Post. Retrieved September 29, 2018. ^ "HowStuffWorks '17 Notable Super Bowl Halftime Shows'". Entertainment.howstuffworks.com. September 15, 2007. Retrieved February 1, 2013. ^ Johnson, Tina; Basham, David (January 6, 2000). "Christina Aguilera, Enrique Iglesias, Toni Braxton To Play Super Bowl Halftime". MTV. Retrieved September 25, 2013. ^ "Super Bowl XXXVIII Halftime Show - Decalz - BMW of TX (vodpod) | Lockerz". vodpod. Archived from the original on February 22, 2012. Retrieved February 1, 2013. ^ "Halftime gig 'dream come true' for Black Eyed Peas". Billboard. Associated Press. February 4, 2011. Retrieved September 29, 2018. ^ a b c "Aquí está el setlist de la Super Bowl de Madonna". cromosomax.com. ^ Madonna to perform at halftime of Super Bowl. Associated Press. Retrieved December 5, 2011. ^ Nicki Minaj To Perform During Super Bowl With M.I.A & Madonna. Yahoo! News. Retrieved January 13, 2012. ^ a b "Super Bowl 47 Halftime Show". National Football League. ^ "Red Hot Chili Peppers will perform at Super Bowl halftime show" (Press release). National Football League. January 11, 2014. Retrieved January 11, 2014. ^ Iyengar, Rishi (October 9, 2014). "Katy Perry Will Play Next Year's Super Bowl Halftime Show". Time. Retrieved October 9, 2014. ^ "Katy Perry to headline Pepsi Super Bowl XLIX Halftime show" (Press release). National Football League. November 23, 2014. Retrieved November 23, 2014. ^ Vena, Jocelyn (January 10, 2015). "Who Will Join Katy Perry During Her Super Bowl Halftime Performance?". Billboard. Retrieved January 10, 2015. ^ "Coldplay will perform at Pepsi Super Bowl 50 Halftime Show" (Press release). National Football League. December 3, 2015. Retrieved December 4, 2015. ^ Coscarelli, Joe (December 3, 2015). "Coldplay Will Play Super Bowl 50 Halftime Show". The New York Times. Retrieved December 31, 2015. ^ Shotgun Spratling (January 8, 2016). "Beyoncé to perform at Super Bowl 50 halftime show". Los Angeles Times. Retrieved January 11, 2016. ^ Ng, Davig (January 28, 2016). "Gustavo Dudamel and Youth Orchestra L.A. to perform at Super Bowl 50 halftime show". Los Angeles Times. Retrieved January 31, 2016. ^ "Bruno Mars to join Beyoncé in Super Bowl halftime show". Entertainment Weekly. February 5, 2016. Retrieved February 5, 2016. ^ "Watch Coldplay, Beyonce and Bruno Mars Rock Super Bowl 50 Halftime". Rolling Stone. ^ "Lady Gaga headlines Pepsi Zero Sugar Super Bowl LI Halftime Show". National Football League. September 29, 2016. Retrieved September 29, 2016. ^ "Here is Lady Gaga's complete Super Bowl setlist". Sports Illustrated. February 5, 2017. Retrieved February 6, 2017. ^ "Justin Timberlake headlines Pepsi Super Bowl LII Halftime Show" (Press release). National Football League. October 23, 2017. Retrieved October 24, 2017. ^ Minsker, Evan (October 23, 2017). "Justin Timberlake to Perform at 2018 Super Bowl Halftime Show". Pitchfork. Retrieved October 24, 2017. ^ Bieler, Des (October 22, 2017). "NFL confirms Justin Timberlake as Super Bowl halftime performer". The Washington Post. Retrieved October 23, 2017. ^ Runtagh, Jordan (February 1, 2018). "Justin Timberlake Shuts Down Janet Jackson Reunion Rumors at Super Bowl LII Press Conference". People. Retrieved September 29, 2018. ^ "U Of M Marching Band Plays Halftime Show With Justin Timberlake". February 4, 2018. Retrieved February 5, 2018. ^ "Stones Decry 'Ridiculous' Super Bowl Censorship". Billboard. February 7, 2006. ^ McGraw, Bill. "JOURNAL: No R-E-S-P-E-C-T for Motown halftime"; December 1, 2005, Detroit Free Press. Retrieved July 3, 2006.